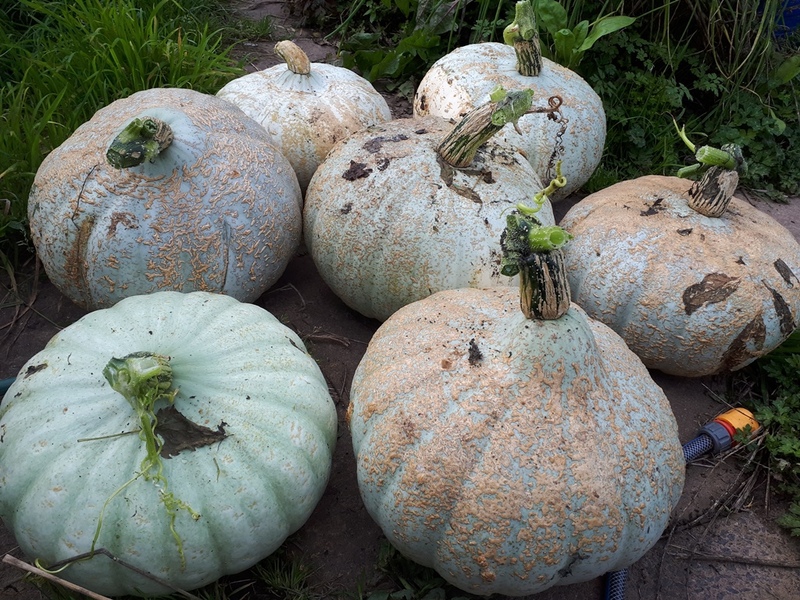 I've started to gather in some of the mature squash so I'm not caught out if there's an early frost. One I was particularity pleased with was my Oregon Homestead squash. These seven fruits are off just two plants! They were planted in the top of last years compost and they seem to have done really well! All my wife said was "how are we going to get into those?" Axe at a guess - I'll keep you posted! Wow! And my husband complains about trying to get into Turks Turbans! I'm notr sure how hard these will be yet but we'll see! I've used many of my carpentry tools int eh past to get into them! Double wow! Good luck! I grow the hard-skinnned squashes too (this year uchiki Kuri or red onion squash) and I find putting them whole in the oven for 15-20 mins softens the skin enough to allow me to get a knife in without losing my fingers. The Kuri varieties tend to keep in my cool airy garage until early March so no pressure to use them up quickly. I've grown 25 from eight plants and as I don't water they aren't huge but are a delicious colour and shape. Good tip! I'm not sure these will fit in the oven though, but it might work with some of the smaller ones of other types. I've kept squash until June before now, stored right (and the right type) they will keep, they're generally the ones with the harder outsides though. Hopefully - i'm yet to try them! I'll let you know! Have you tried banana squash Kev ? we have grown about 35 different types so far and the banana are about the nicest we have tried, they kept till july and the skin was easily cut into rings....a definite bonus. This year another new one is Victor, very attractive and grew well in Carmarthenshire. We are looking forward to trying it. 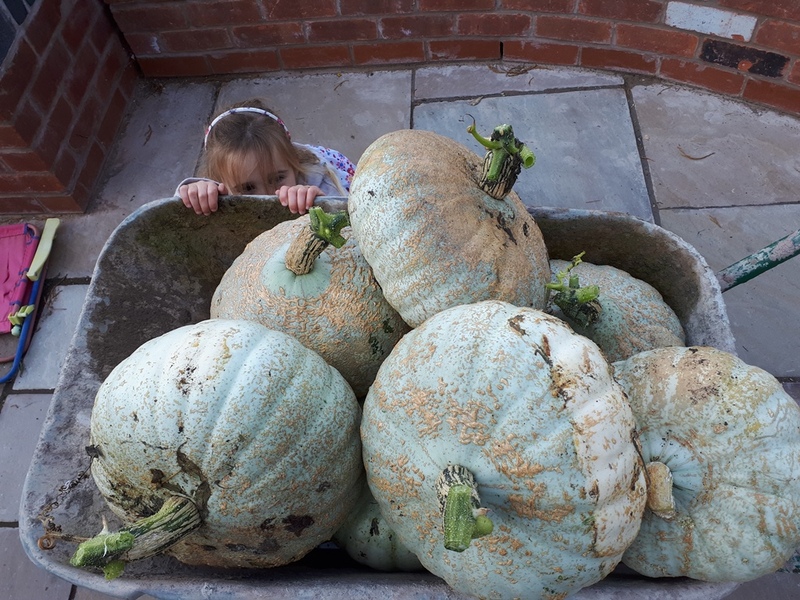 One year we had rugby ball shaped blue pumpkins (from Italian seed) that grew on vast vines and were so big that they took two people to lift. We used a chisel & hammer to split them open & then a saw to portion them up for use. However the flesh was bright orange, very tasty & 'dry' in texture - perfect for roasting. Because of the dry flesh they also stored very well sliced open, even outside as we obviously couldn't get them in the fridge. Since then we've been trying to find an equally delicious pumpkin that's a more manageable size, but in the way of these things none fully measure up so far.